Do you need a marketing package? A lot of businesses struggle to find the right marketing package for their business. Search engine marketing packages can be expensive and especially start-up businesses don’t have the resources yet to sign up for a full fetched marketing package. Not every business needs ad-words programs or extensive online marketing so we have come up with a few packages that can be customized for your specific needs. One thing all websites should absolutely have is fresh content. Since Google has changed their ranking results to mainly content-driven results, it is very important that your website gets fresh content frequently, so it doesn’t drop back in your ranking as time goes by. Most business owners are busy running their business and don’t have time to write content and new articles for a blog. Other business owners have portfolios of their work they would like to show on their website but struggle to forward their work photos efficiently to their web designer to get them posted. We took some of the most challenging parts of content creation and created a few solutions for you. Small businesses who want fresh content and don’t have time to write them or do not have portfolio work to show. Businesses who want to grow their online presence with minimal effort and cost. All businesses. The marketing suite is created for all businesses even ones without a website. The suite is an online platform that gives you easy access to upload/ showcase your work, projects, track your website traffic, collect reviews, use online chat and more. Especially useful for contractors, artists, realtors, plumbers or other service businesses who rely on reviews. Businesses who are serious about their advertising and want to make the most out of their online presence. Grow your website organically as well as with targeted advertising. Don’t have a website yet but need some website representation? Our landing website listing can act as an alternative to having an own website. There are several directory listings out there, many of them are even free (well, if you can withstand the occasional sales calls trying to sell you premium listings). But when was the last time you saw your directory listing come up in search results from say: yp.com or superpages? 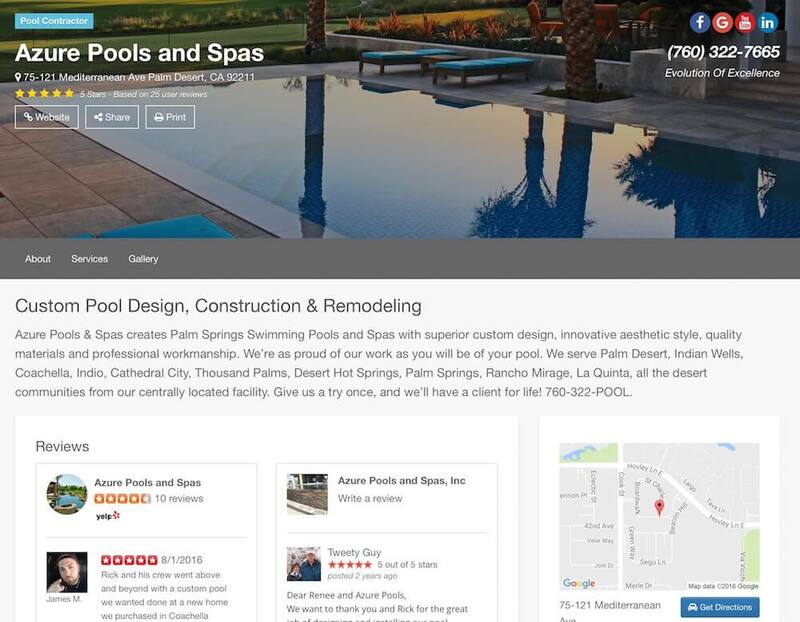 An outside listing can create a back link to your website which can help with your organic search results.The only relevant directory listings today seem to be Yelp and Google+. If you have a Yelp business page, you probably know about the dreaded review filter from Yelp and Google+ has now widely removed pages for businesses. Our directory can compile your reviews from Yelp , Google+ and Facebook as well create multiple back links for all your services and much more.